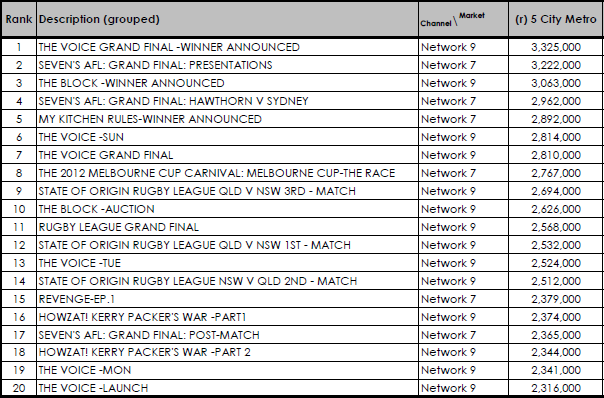 Channel Seven outrated Nine in 2012, taking a greater share of audience across the 40-week ratings period. Combined, the Seven Network’s various free-to-air channels took 30.6% of the year’s ratings compared to 28.3% for Nine, according to OzTAM. Network Ten took an 18.7% share of the year’s audience, while ABC took 16.9%. SBS followed with 5.4%. Nine’s The Voice dominated the top programs for the year, taking out six of the top 20 spots, including first place for its final show which attracted 3.3 million viewers. In second place was Seven’s AFL Grand Final coverage with 3.2 million viewers. It was again a year for reality TV with the final of Nine’s The Block ranking in third place, with 3.1 million viewers, and Seven’s final of My Kitchen Rules coming in fifth, with 2.9 million viewers. Sporting events played a big role in the ratings battle, with the AFL and NRL grand finals, all three State of Origin matches and the Melbourne Cup taking top 20 spots. Seven’s purchase of US hit Revenge was the top drama for the year, ranking 15th with its first episode drawing 2.4 million viewers. Nine took out the top Australian mini-series, with both instalments its Howzat! Kerry Packer’s War making the top 20 boasting an average audience of 2.3 million.